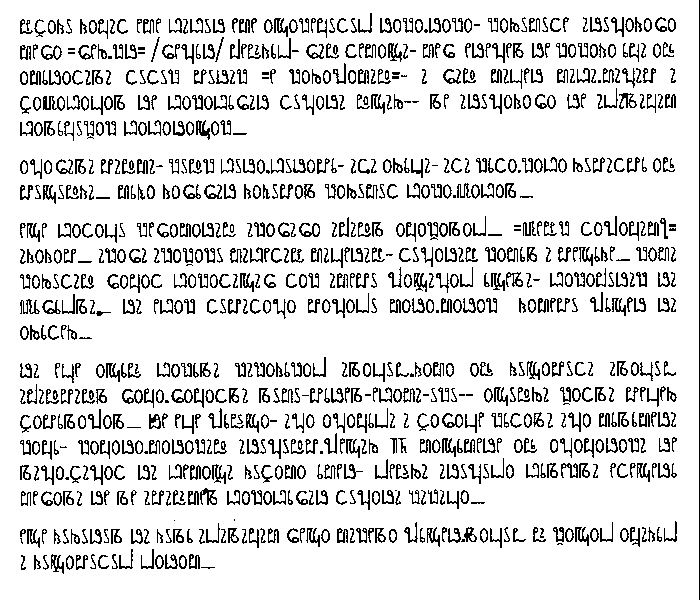 15 June 2002-- This passage was recently offered on the Conlang List, in French, English and German as a translation exercise-- my version mostly follows the English, but not always. (We are told the original is copyrighted material.) Since most of the vocabulary here can be found in the Dictionary or the Supplement, rather than give a full interlinear translation I have decided simply to gloss new items (not yet entered in the Supplement) at the bottom of this page. letrayu, yambit eme cicur eme andakembutuç raka-raka, kañumute irungayasa mesa "seng-kr"[sengor] feliyoç, sila temandri, mes erengen re kakaya ombi alo amoratini tutuk purik "e kañahamila", i sila minjer mici-mingip i travacanjan re cakacosir tungari landiñ--ne irungayasa re içinimbim canombukrak cacarandak. Today, both by radio and huge billboards, the populace was informed by 1 Gwr "Sage", 3 senior priests, 1 admiral well-known because of his membership in the secret "Builders" society, and 3 utterly insignificant and untrustworthy MPs who are toadies of the banking interests-- it [the populace] was informed that our nation is at great risk of starvation. angasini, pilami, kunak cura-curacupo, iti añonji, iti kota-kaca ñupitpo alo pundulayi. mowa yasosir yawupan kañumut cakavacan. At first, I thought, probably just malicious gossip, or a trick, or just the usual nonsense from the palace. But the gullible populace heard it and took it in. ri enje andoli çakoni kikayokaç inanjul-yama alo yundraputi, inanjul ifilapilan samba-sambatni numu, poren, ecami, uku--andulañi, kratni penjeñ traponahan. ri enje holunda, inga angamboçi, i trasanje kotani inga ñonomeri kambo, kambara-marakila irungulap-hendiñ rofolakét mandomere alo angambaraki re ninga-tringat ri cemandri yutrama omer, çeluñi irunguça conekni etendero mesani re ne ipilimen cakacosir tungari kikinja. In Andoli City a gang of roughnecks looted a warehouse, making off with great quantities of fish, wine, candy, uku [grain]-- unfortunately, most of it rotten and inedible. In Holunda City, without any niceties, and needless to say without a proper trial, an angry mob hung 26 lawyers from a hastily-built scaffold in the Law Temple plaza, and afterward set fire to the office of a newspaper which they considered subservient to the oppressing class. ende yuñurun ri yuno içinimbim senda mikena honder-nanjul li(=ri) krandaç, ambriyoç i yundraputuç çaram. And so everywhere in our land we are suffering looting at the docks, farms, and military storehouses. --nanjul-yama: colloq. compd. 'steal+run', hence, to loot, to smash-and-grab, etc.